June 16, 2016 / Steve M.
Here we go again, having disposed of all of nearly all my Losfeld Clandestine titles it appears that I may have stumbled upon another. If the above title has caused some confusion, allow me to clarify. The book in question has the cover as below. But as you can see, again below, the contents differ. The only constant factor is the name Fukwell, which is one of several pseudonyms used by Alphonse Momas, one of the most prolific pornographers of the last century. 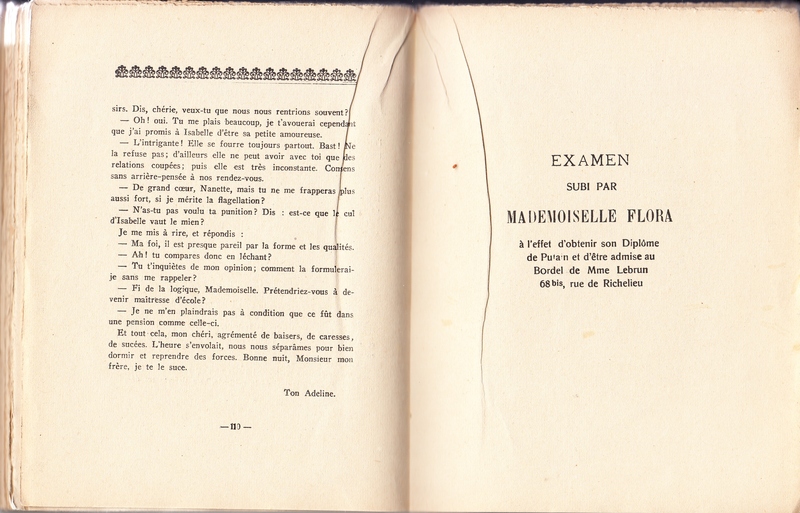 The actual book we are dealing with has a total of 127 pages, 110 of which appear to constitute the main text of the Fruit Verts, the remainder is entitled ” EXAMEN SUBI PAR MADEMOISELLE FLORA” which appears to be to be a poetic dialogue. 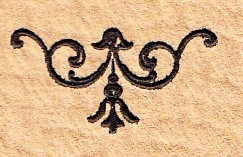 this section also contains the only bound in illustration in the book. Fruits verts, par Fuckwell. Paris-Bruxelles [Paris: printed by Chas. Renaudie for Duringe], 1902. 8vo. Two volumes, pp. [iv]+134, [iv]+129. 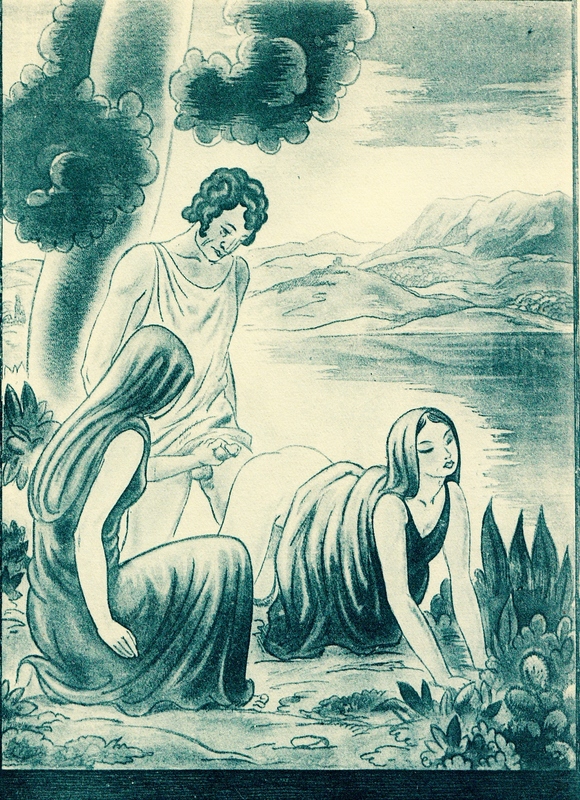 British Library: P.C.15.aa.35. 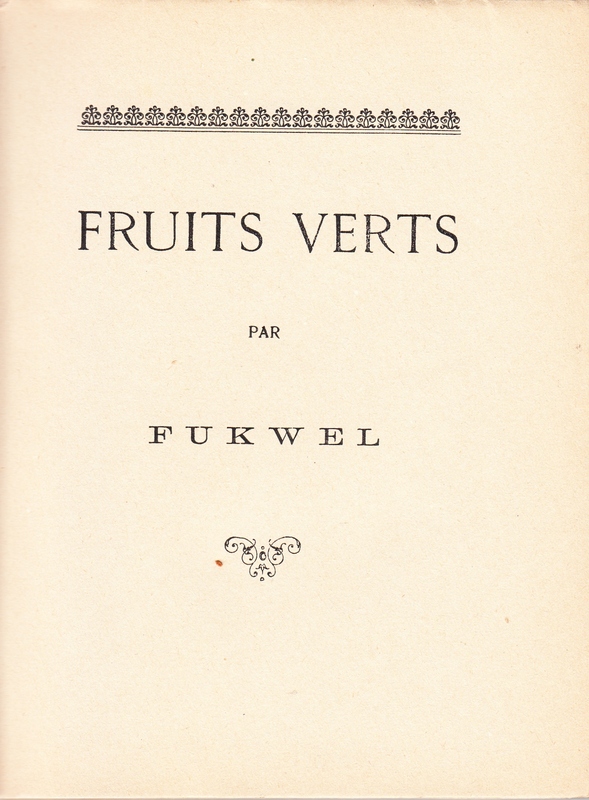 Fruits verts, par Fuckwell. Paris-Bruxelles, 1902. 8vo. Two volumes, pp. 268. Fruits verts, par Fuckwell. Paris-Bruxelles [c. 1920]. 8vo. pp. 244. 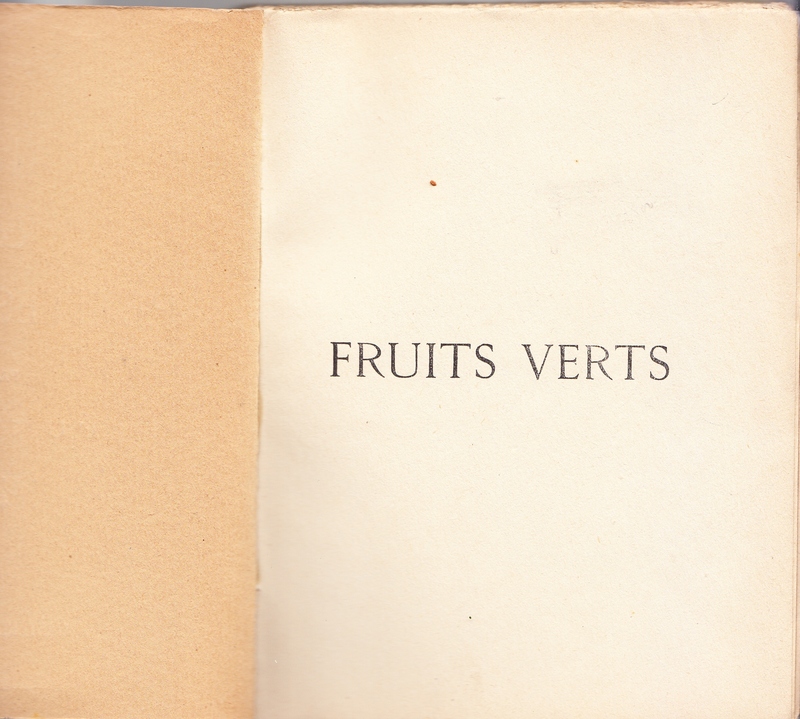 Fruits verts, par Fukwell [sic]. [c. 1920] 8vo. Petites et grandes filles, par Le Nismois. 8vo. Cited in a clandestine catalogue, and probably published at Amsterdam by Auguste Brancart about 1891. Petites et grandes filles, par Fuckwell. Londres-Paris [Rotterdam: Bergé, c. 1893.] 8vo. pp. 248. British Library: P.C.15.aa.34. Petites et grandes filles, par Fukwell. Paris-Londres [Paris, c. 1924]. 8vo. pp. 216. Petites et grandes filles. [Paris:] En Souvenir d’Isidore Liseux, 1924 [Eric Losfeld, c. 1955]. 8vo. pp. 137. [Petites et grandes filles] Pot Pourri, [par] J. Le Nismois. Paris: Editions de Poèle, Square du Champs de Mars, 1949 [Eric Losfeld, c. 1955]. 8vo. 66 ff. 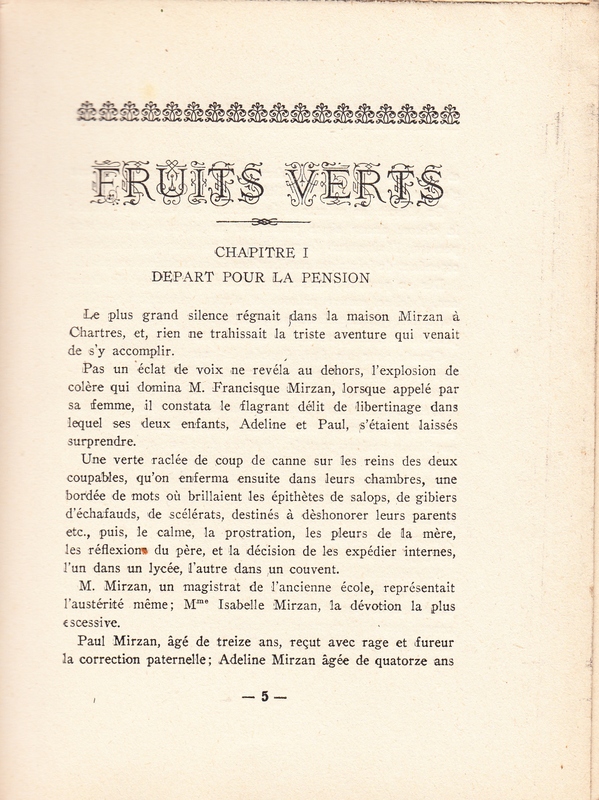 An English translation of Petites et grandes filles, as Green Girls, was printed at Paris in 1899 by Renaudie for Duringe and Leonard Smithers. A modern reprint of this was published at New York by Grove Press in 1971. 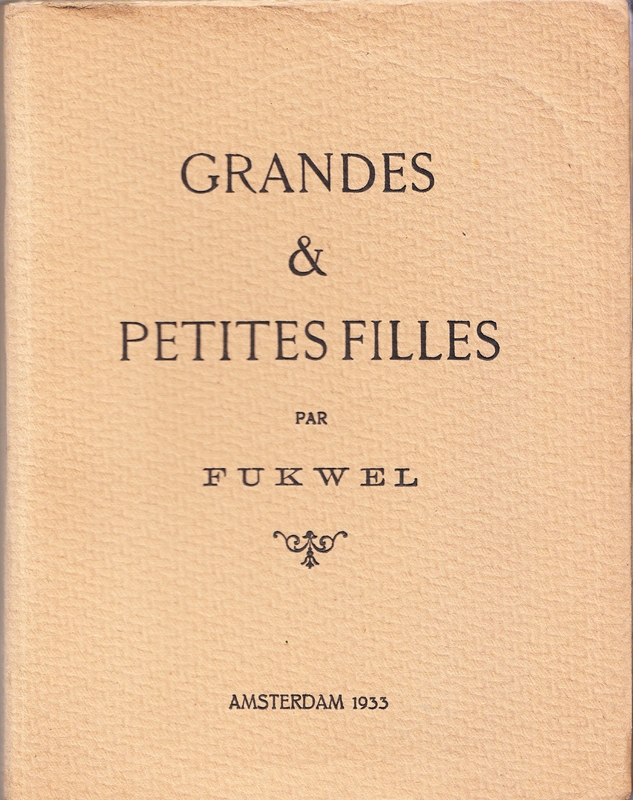 You will note that none of the above are entitled Grandes & Petites Filles, as the first two title words are reversed in the original, in addition there is no record of an Amsterdam 1933 edition. Having raised these questions with Pat Kearney, his sage advise is thet this hotch potch is most likely a Losfeld Clandestine title, and therefore probably dates around the mid 1950’s. Just to complicate things even more my copy has an extra 8 illustrations tipped in, a suite of six small monochrome images and 2 slightly larger illustrations in blue. I am reasonably confident that none of these belong to the book, but as I have no idea what they do belong to I am copying them here for your enjoyment. Any information or questions about this tile please complete a contact form.